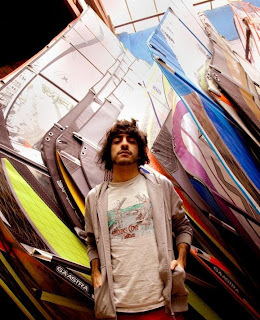 2008 has proved fruitful for Spanish "one man carnival" el Guincho, starting off with a nice write up over at Gorilla vs Bear, an 8.3 Pitchfork album review and debut shows in North America and the UK. Unfortunately, I missed his trip over last week, which included what I've heard was a rather good show with Fanfarlo and Munch Munch (both featured on Keep Hope Inside in the past) at London clubnight, White Heat. I believe he's even been signed to XL offshoot Young Turks to release the LP 'Alegranza' over here in the UK. If you keep your eye on the music blogosphere, you'll be more than aware of Pablo Diaz-Reix, as he's known his mum and dad, by now. His mix of world music puts the likes of Vampire Weekend and Yeasayer to shame, combining bhangra/tabla, tropicalia, tribal beats and just about anything else that he sees fit. So while I love his joyful mish mash of about 37 different genres, you can go read about all that elsewhere. Or simply have a listen. Instead, I'd like to bring his recent Bjork cover for Stereogum to your attention - 'Cover Me'. So he did. It's very different to the haunting, minimalist original and probably not to many Bjork fans' tastes. Here's what Pablo had to say about creating his version of 'Cover Me'. "At first, I asked my ex-girlfriend to record some voice tracks for the song and tried to figure out how to fit it with another idea that I had: Like a 6-8 minute trip inspired by the remix Walter Gibbons did for Indian Ocean's 'Treehouse/Schoolbell.' But I ended up discarding the Indian Ocean idea and went a little bit old school UK garage! The other track I was working on sounded kinda similar to the original, like I was looping some all the original parts of the song and using a female voice, too, so I thought it was interesting to try a simple 2-step beat under the same universe, keeping the structure but changing the vocals and the vibe, kinda like dressing Björk in dirty clothes and taking her to the place she's trying to avoid in the lyrics. I am super excited to be a part of this." That was stolen from Stereogum.com by the way, a site which I'm sure you're familiar with anyway. In case you're not, it is basically the king of all music blogs and occasionally gathers some exciting artists to compile tribute albums. This one features No Age, Liars, Xiu Xiu and some other bands that you've doubt heard great things about recently. I strongly suggest you head to Stereogum to check out the tribute albums and everything else they have going on over there [link]. Originally available from Stereogum [link]. If you fancy free (legal) el Guincho mp3s of his own stuff, make your way to his MySpace, where you can download 'Palmitos Park' por nada [link] and 'Fata Morgana' from RCRD LBL [link].